The road ended a long time ago. Since then, you’ve been following tire tracks. They’re clear and easy to follow most of the time, though every once in a while you lose sight of them for a few feet or yards or miles. There are snow-capped mountains in the distance. An island, flamingos, and llamas are up ahead. While you’re surrounded by white mounds. Large ones stand like obstacles, and tiny ones stick to your four-wheel-drive vehicle. They’re all made of salt. Welcome to Salar de Uyuni, the largest and highest salt flats in the world. The more than 4,000-square-mile area sits upward of 12,000 feet above sea level in southwestern Bolivia near the Chilean and Argentine borders. Lago Minchín, a prehistoric salt lake, once covered this corner of the country. Salt, lots and lots of salt, was all that remained when the lake dried up. 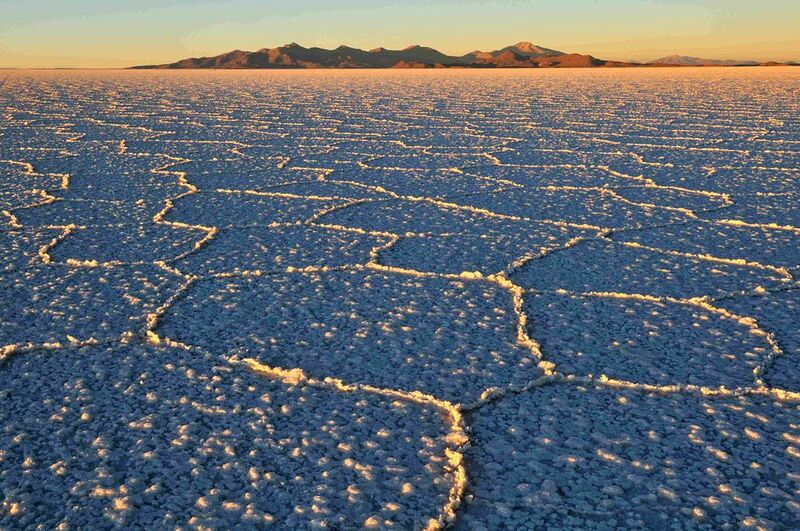 You arrived in Uyuni to begin exploring the huge salt desert. The small city, which sits on the edge of the flats, can’t grow much on the land surrounding it. A scarce water supply, plus high-salt concentrations in what little water is available, ensured that. Instead, Uyuni was built as a trading post in the late-19th century. A railroad once carried minerals to ports along the Pacific. After the mining industry collapsed, tourism became Uyuni’s main source of income. Mechanics spray vehicles with oil to prevent the salt from sticking. Car washers hose the rest of the salt off after your drive. A huge market is in the center of town. And hotels are made of salt, of course. You’re staying at one of these salt hotels. 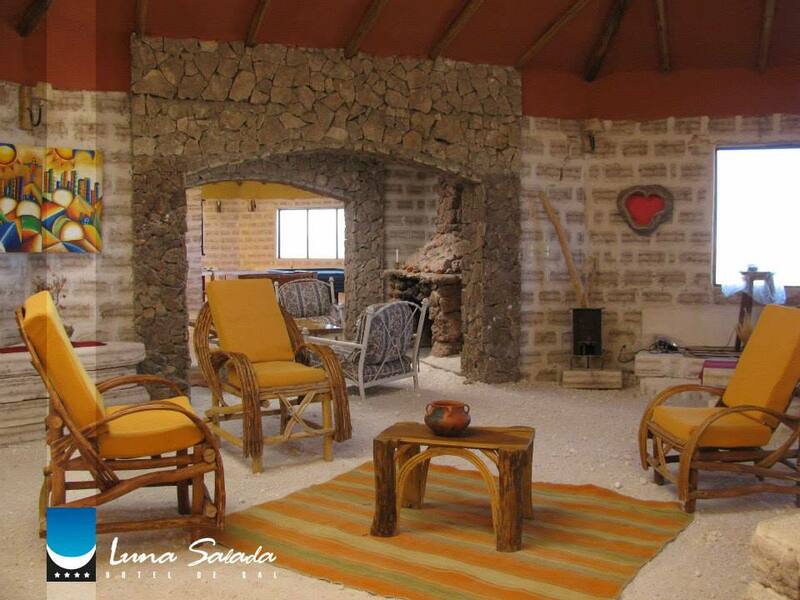 Hotel de Sal Luna Salada overlooks the salt flats. During the wet season, from December to March or April, a thin layer of water covers the flats, making them look like a huge mirror. The rest of the year, it’s parched, windy, and cold. The hotel’s living room has a salt sofa and a big fireplace. Tunupa Restaurant features salt tables, seasonal food, and Andean wine. Your room overlooks the currently dry lakebed. The nightstand, the desk, and even the walls are made of blocks of salt. They’re supposed to provide positive energy as you sleep. If you can stop staring at the sky, that is. Since you’re in the middle of nowhere, at a high elevation, and it’s so dry, you can see constellations rarely seen elsewhere. Besides dreaming of faraway galaxies and racing across the flats, there are a few other things you won’t want to miss during your visit. Drive to Incahuasi Island in the middle of the lake. The island is the remains of an ancient volcano. It’s now lined with giant cacti, coral formations, and fossils. Hike Tunupa Volcano, another dormant volcano, on the northern side of the lake. Climb into the Galaxy Cave, where stalactites and stalagmites look like bones hanging from the ceiling. Visit the Green Lagoon, which looks emerald due to the high-mineral content, and the Red Lagoon, where hundreds of flamingos live. And don’t miss the Salvador Dalí Desert, where strange rock formations look like they belong in a surrealist painting. Actually, this entire trip has been pretty surreal.